How Much Do Court Reporters Earn in New Jersey? Court reporters, also known as shorthand reporters in New Jersey, are responsible for keeping written, verbatim record of legal proceedings, whether in court, private or government settings. In addition to judges, lawyers, witnesses and juries, court reporters play a crucial role in the dispensation of justice. Therefore, if you do not have the will or means to become a lawyer, consider becoming a court reporter, since court reporters are as integral to any legal system as lawyers and judges are. However, before you learn how to become a court reporter in New Jersey, know the types of court reporters in detail. This is important since each type may have its own qualifications. These court reporters take down records of proceedings, be it court proceedings or administrative hearings. These court reporters write testimony or the spoken word verbatim especially at arbitration or deposition hearings. These types of court reporters provide realtime captioning for live television events such as sports events and weather emergencies. If you turn on closed captioning function on your TV, you will see a feed at the bottom of your TV screens. This feed is prepared by these court reporters. 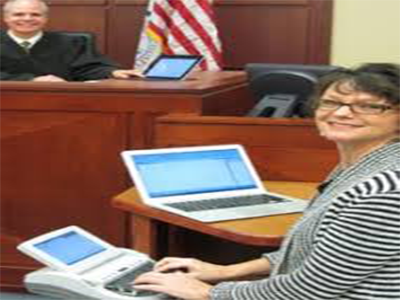 These court reporters provide realtime reporting services for internet-based events. These types of court reporters provide specialized services to hard-of-hearing people in live situations. Once you are certified, your certification is good for two years. To renew, you will need to obtain continuing education credits. According to May 2017 statistics taken from the US Bureau of Labor Statistics (BLS), court reporters earned the annual mean wage of $58,420, which is more than what court reporters earned in Florida and Pennsylvania, two of the biggest states that employ court reporters.